Talk about an early bloomer! 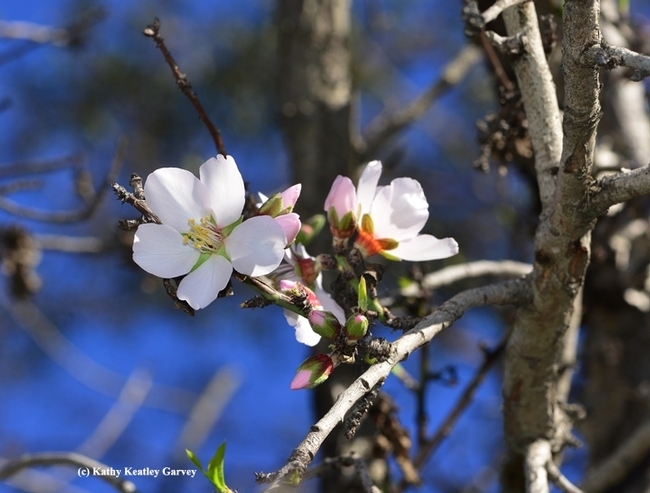 At least one almond tree was blooming in California on the first day of the year. In the Benicia State Recreation Area, to be exact. 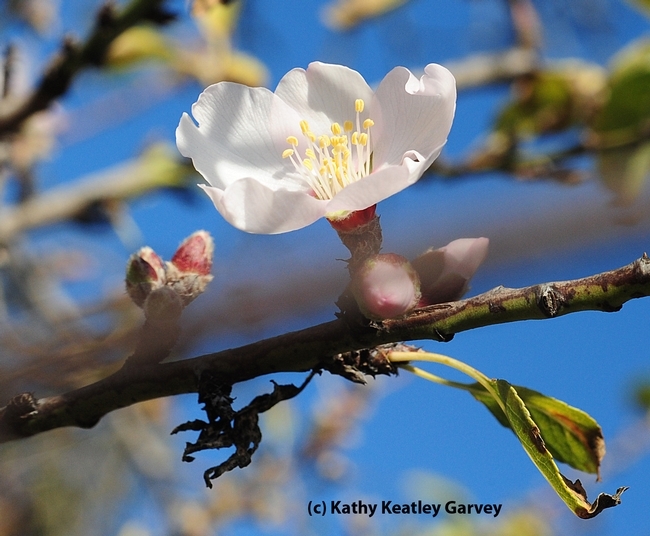 We spotted the almond tree flowering on Jan. 1 near the entrance to the state park. The delicate white blossoms poked through a rusty fence as they were dignitaries at a meet-and-greet reception. 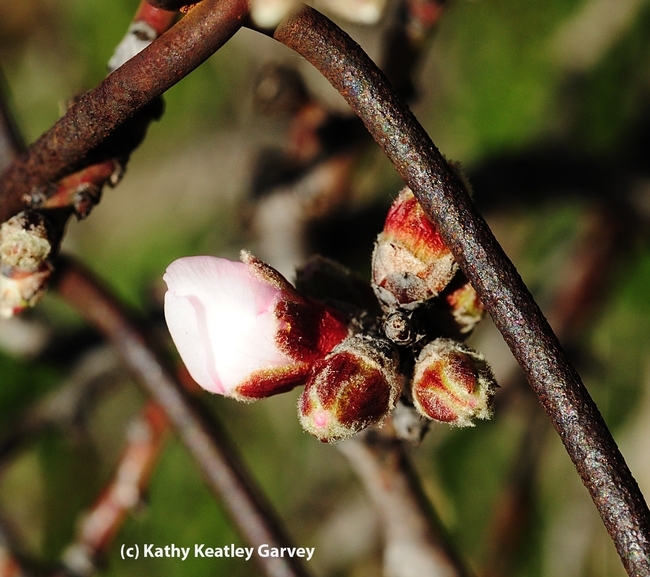 From the looks of the blossoms, the buds had probably opened in late December, maybe shortly after Christmas. 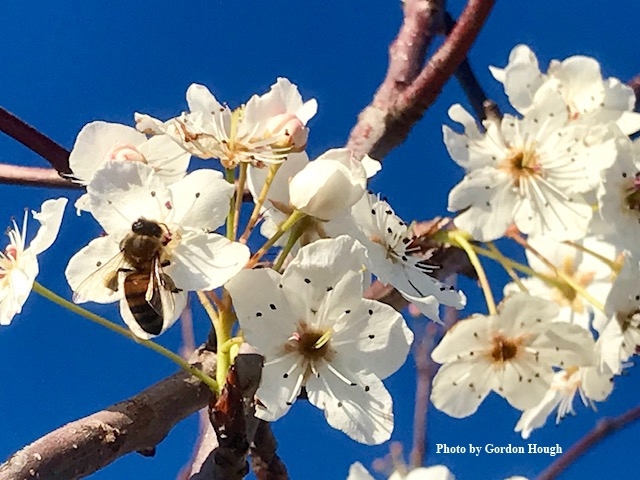 We're accustomed to seeing wild almond trees flowering in mid- to late January as we drive along Interstate 80, Solano County. But not this early! Jan. 1? 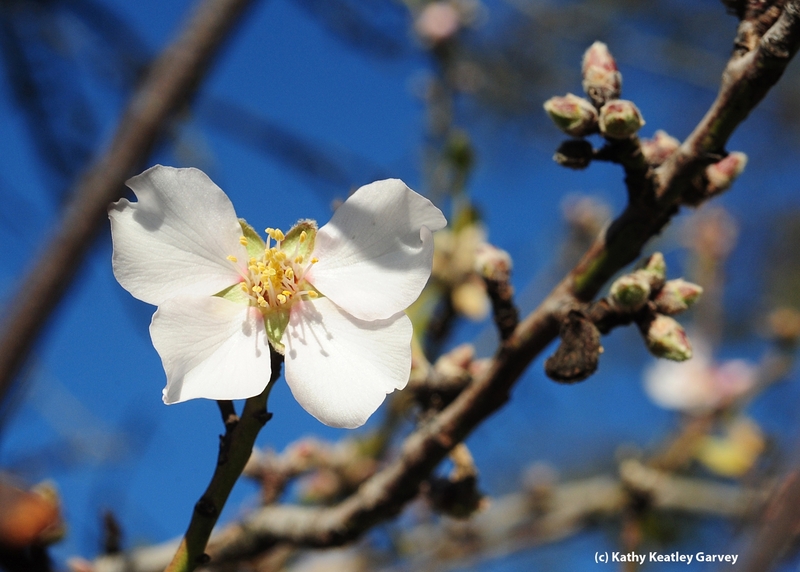 California's commercial almond trees usually begin blooming around Valentine's Day, Feb. 14. Our state has about 800,000 acres of almonds, each acre requires two hives for pollination. The buzzing bees are trucked here from all over the country. Indeed, California's $3 billion-almond industry--the state's largest export--is pure gold. Meanwhile, it's too bad that there's no contest for finding the first almond tree blooming. Butterfly expert Art Shapiro, professor of ecology and evolution at UC Davis, sponsors a contest for anyone collecting the first cabbage white butterfly in the three-county area of Yolo, Solano and Sacramento. The prize he offers is a pitcher of beer. Maybe there should be beer for a bud? There's only one thing wrong with the bucolic scenes below: no foraging bees. But there will be.